The Coalition Against Piracy members toast the launch of CAP. The Asian branches of companies such as NBCUniversal, Sony Pictures and The Walt Disney Company banded together this week to initiate work against the threat of content piracy. The Coalition Against Piracy (CAP) united at the annual CASBAA conference in Macau yesterday to begin work to address the increasingly complex issues surrounding illegal downloading andstreaming. Among the 18 partner companies involved are Viacom International Media Networks, NBCU, Sony, Disney, HBO Asia, A+E Networks, Fox Networks Group, Turner, BBC Worldwide, TV5Monde, BeIN Asia, PCCW Media and True Visions. Industry body CASBAA recently established CAP after identifying piracy’s effects on the traditional pay TV and OTT markets in the Asia, with one survey recently suggesting as many as 14% of consumers in Sinapore admitting to regularly using an ‘illicit streaming device’ ISD). 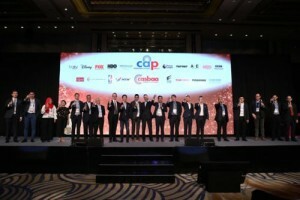 “The driving force behind establishment of CAP is the need for united, collective action by all branches of the video industry”, said CASBAA’s chief policy officer, John Medeiros. Last week, a Digital TV Research report suggested illegal piracy of films and TV cost companies US$31.8 billion, with the figure expected torise to nearly US$52 billion in 2016. In June, the likes of Netflix, Amazon, BBCWW, CBS Corp., NBCU, Paramount Pictures, Sony, Fox, Disney and Warner Bros. Entertainment came together to form the Alliance for Creativity and Entertainment, a US-based body aiming at similar goals to CAP.